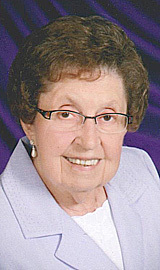 NEW ULM — Dolores (Mrs. Louis) Kahle, age 95, of New Ulm, died Thursday, April 11, 2019 at Divine Providence in Sleepy Eye. Mass of Christian Burial will be 10:30 a.m. on Tuesday, April 16, 2019 at the Cathedral of the Holy Trinity in New Ulm, with burial in the New Ulm Catholic Cemetery. Monsignor John Richter will celebrate the Mass. Visitation will be 4-7 p.m. on Monday, April 15, 2019 at the Minnesota Valley Funeral Home – NORTH CHAPEL in New Ulm. Visitation will continue from 9 to 10 a.m. Tuesday at the funeral home. To leave an online condolence for her family or to sign the guestbook go to: www.mvfh.org. Dolores is survived by her daughters, Sharon (Barry) Johnson of Chandler, AZ, Sandra (Doug) Lowinske of Atlantic City, WY, and Susan (Chris) Wiskow of Dayton, MN; grandchildren, Sarah Burson, Heath Lowinske, Melissa Casey, and Cole Wiskow; great-grandchildren, Kate, Kahle, Hannah & Jack Burson, Douglas, Chancy, & Garrett Lowinske, and Lorelei, Shawn Jr., Mae Lynn, and Amelia Casey; a sister, Rosalin LeMoine of New Ulm; sisters-in-law, Cleo Polzin and Dorothy Marquardt, both of New Ulm, and Rosalin McIntyre of Champlin; and several nieces, nephews, and other relatives. She was preceded in death by her husband, Louis; her parents; a brother, Clarence Polzin; brothers-in-law, Eugene LeMoine, Harvey Marquardt, Norbert Helget, Adolph Kahle, and Thomas Kahle; and sisters-in-law, Doris Kahle and Eleanor Helget. Dolores M Polzin was born on April 8, 1924 in Nicollet County to Henry & Rosa (Klingler) Polzin. She grew up and attended parochial school in St. George. Dolores graduated from New Ulm High School in 1942, and later from St. Paul Business School. She was united in marriage to Louis J. Kahle on June 1, 1946 at the Church of St. George. Dolores lived in New Ulm most of her married life. She was employed at several places with her last being at Fischer Drug and Sikora Drug for 14 years. She retired in 1990. Dolores was a member of the Cathedral of the Holy Trinity, St. Ann’s Catholic Order of Foresters, Oak Hills Auxiliary, and the Hummdinger Kitchen Band, where she played the dish pan. She also volunteered at the New Ulm Medical Center surgery room. Dolores enjoyed making porcelain dolls and snow babies, doing picture albums, and collecting Beanie Babies. Her family really loved the chocolate chip cookies she would make frequently for them. Dolores & Louis loved to travel and often went in their mini-home. Travel included trips to Germany and Hawaii. She spent some winters in Arizona with her daughter’s family in Chandler. The last time she was there was in December of 2018 when she was 94. In lieu of flowers, the family request memorials to the donor’s choice.